The Encyclical takes its name from the invocation of Saint Francis of Assisi, “Praise be to you, my Lord” which in the Canticle of the Creatures reminds us that the earth, our common home “is like a sister with whom we share our life and a beautiful mother who opens her arms to embrace us” (1). We ourselves “are dust of the earth (cf. Gen 2:7); our very bodies are made up of her elements, we breathe her air and we receive life and refreshment from her waters” (2). “This sister now cries out to us because of the harm we have inflicted on her by our irresponsible use and abuse of the goods with which God has endowed her” (2). Her cry, united with that of the poor, stirs our conscience to “acknowledge our sins against creation” (8). Taking the words of the“beloved” Ecumenical Patriarch Bartholomew, the Pope reminds us: “For human beings… to destroy the biological diversity … by causing changes in its climate …; to contaminate the earth’s waters, its land, its air, and its life – these are sins”(8). The appropriate response to such penitence is what St John Paul II already called a “global ecological conversion” (5). In this, St Francis of Assisi is “the example par excellence of care for the vulnerable and of an integral ecology lived out joyfully and authentically. […] He shows us just how inseparable is the bond between concern for nature, justice for the poor, commitment to society, and interior peace” (10). The Encyclical Laudato si’ (Praised Be You) is developed around the concept of integral ecology, as a paradigm able to articulate the fundamental relationships of the person: with God, with one’s self, with other human beings, with creation. As the Pope himself explains in n. 15, this movement starts (ch. I) by listening spiritually to the results of the best scientific research on environmental matters available today, “letting them touch us deeply and provide a concrete foundation for the ethical and spiritual itinerary that follows”. Science is the best tool by which we can listen to the cry of the earth. The next step (ch. II) picks up the wealth of Judeo-Christian tradition, particularly in biblical texts and in theological reflection on them. The analysis is then directed (ch. III) towards “the roots of the present situation, so as to consider not only its symptoms but also its deepest causes”. The objective is to develop an integral ecological profile (ch. IV) which, in its various dimensions, includes “our unique place as human beings in this world and our relationship to our surroundings”. Insisting on transparent and inclusive dialogue, Pope Francis proposes (ch. V) a series of guidelines for the renewal of international, national and local policies, for decision-making processes in the public and business sector, for the relationship between politics and economy and that between religion and science. Finally, based on the conviction that “change is impossible without motivation and a process of education”, chapter VI proposes “some inspired guidelines for human development to be found in the treasure of Christian spiritual experience”. Along this line, the Encyclical offers two prayers, the first to be shared with believers of other religions and the second among Christians. The Encyclical concludes, as it opened, in a spirit of prayerful contemplation. the throwaway culture and the proposal of a new lifestyle (16). The dialogue that Pope Francis proposes as a method for addressing and resolving the environmental problems is followed throughout the Encyclical. It refers to contributions by philosophers and theologians, not only Catholic but also Orthodox (the already cited Patriarch Bartholomew) and Protestant (the French thinker Paul Ricoeur) as well as the Islamic mystic Ali Al-Khawas. The same occurs in the key of that collegiality that Pope Francis has proposed to the Church since the beginning of his ministry: alongside the references to the teachings of his predecessors and of other Vatican documents (in particular of the Pontifical Council for Justice and Peace), there are many taken from numerous Episcopal Conferences from all continents. It is clear that, after Laudato si’, the examination of conscience (the instrument that the Church has always recommended to orient one’s life by reflection on one’s lived relationship with the Lord) should include a new dimension. One would regularly review, not only how one has lived in communion with God, with others and with oneself, but also with all creatures and with nature. The attention that the media has given to the Encyclical before its publication has primarily concentrated on aspects tied to the environmental policies currently being discussed on the global agenda. Certainly Laudato si’ can and must have an impact on important and urgent decisions to be made in this area. However, the magisterial, pastoral and spiritual dimensions of the document must not be put in second place. Its value, breadth and depth cannot be reduced to the mere scope of determining environmental policies. This chapter presents recent scientific findings on the environment as a way of listening to the cry of creation, “to become painfully aware, to dare to turn what is happening to the world into our own personal suffering and thus to discover what each of us can do about it” (19). It thus deals with “several aspects of the present ecological crisis” (15). Pollution affects the daily life of people with serious consequences to their health, so much so that it causes millions of premature deaths (20), while “the earth, our home, is beginning to look more and more like an immense pile of filth” (21). At the root of this situation we find the “throwaway culture”, which we have to oppose by introducing models of production based on reuse and recycling and by limiting the use of non-renewable resources. Unfortunately, “only limited progress has been made in this regard” (22). “Climate change is a global problem with serious implications, environmental, social, economic, political and for the distribution of goods” (25). Climate changes afflict entire populations and are among the causes of migration movements, but “many of those who possess more resources and economic or political power seem mostly to be concerned with masking the problems or concealing their symptoms” (26). At the same time, “our lack of response to these tragedies involving our brothers and sisters points to the loss of that sense of responsibility for our fellow men and women upon which all civil society is founded” (25). To preserve the climate “represents one of the principal challenges facing humanity in our day” (25). Entire populations, and especially children, get sick and die because of contaminated water, while aquifers continue to be polluted by discharges from factories and cities. The Pope clearly states that “access to safe drinkable water is a basic and universal human right, since it is essential to human survival and, as such, is a condition for the exercise of other human rights” (30). To deprive the poor of access to water means “they are denied the right to a life consistent with their inalienable dignity” (30). Extinction of plant and animal species caused by humanity changes the ecosystem, and future consequences cannot be predicted. “Each year sees the disappearance of thousands of plant and animal species which we will never know, which our children will never see, because they have been lost for ever” (33). The diverse species are not just an exploitable “resource”: they have a value in and of themselves, which is not in function of human beings. “All creatures are connected …, for all of us, as living creatures, are dependent on one another” (42). The care of richly biodiverse areas is necessary for ensuring the equilibrium of the ecosystem and therefore of life. Often transnational economic interests obstruct this protection (38). The current model of development adversely affects the quality of life of most of humanity, showing “that the growth of the past two centuries has not always led to an integral development” (46). “Many cities are huge,inefficient structures, excessively wasteful of energy and water” (44), becoming unlivable from a health point of view, while contact with nature is limited, except for areas reserved for a privileged few (45). “The deterioration of the environment and of society affect the most vulnerable people on the planet” (48), the greater part of the world’s population. In international economicpolitical debates, they are considered “merely as collateral damage” (49). Instead, “a true ecological approach always becomes a social approach … so as to hear both the cry of the earth and the cry of the poor” (49). The solution is not reducing the birth rate, but counteracting “an extreme and selective consumerism” of a small part of the world’s population (50). Aware of major differences over these issues, Pope Francis shows himself to be deeply affected by the weak responses in the face of the tragedies of many people and populations. Even though there is no lack of positive examples (58), there is “complacency and a cheerful wrecklessness” (59). Culture and adequate leadership are lacking as well as the willingness to change life style, production and consumption (59), while urging “the establishment of a legal framework which … can ensure the protection of ecosystems” (53). To face the problems illustrated in the previous chapter, Pope Francis selects from the Judeo- Christian tradition. The Biblical accounts offer a comprehensive view that expresses the “tremendous responsibility” (90) of humankind for creation, the intimate connection among all creatures and the fact that “the natural environment is a collective good, the patrimony of all humanity and the responsibility of everyone” (95). The complexity of the ecological crisis calls for a multicultural and multidisciplinary dialogue that includes spirituality and religion. Faith offers “ample motivation to care for nature and for the most vulnerable of their brothers and sisters” (64); responsibility for nature is part of Christian faith. In the Bible, “the God who liberates and saves is the same God who created the universe, and these two divine ways of acting are intimately and inseparably connected” (73). The story of creation is key for reflecting on the relationship between human beings and other creatures and how sin breaks the equilibrium of creation in its entirety. These accounts “suggest that human life is grounded in three fundamental and closely intertwined relationships: with God, with our neighbour and with the earth itself. According to the Bible, these three vital relationships have been broken, both outwardly and within us. This rupture is sin” (66). The earth is a gift, not a possession; it was given to us to administer, not to destroy. Hence, we must respect the laws of nature, as all of creation has its own goodness. The psalms with their invitation to praise the Creator prayerfully remind us of this. A spirituality which fails to recognize Almighty God as Creator will provide no support as we end up worshipping other worldly powers, “usurping the place of God, even to the point of claiming an unlimited right to trample his creation underfoot” (75). “Creation can only be understood as a gift from the outstretched hand of Father of all” (76). “We can ascend from created things ‘to the greatness of God and to his loving mercy’” (77), and creation in the risen Christ continues onward until “the fullness of God” (83). In this universal communion, the human being, gifted with intelligence and personal identity, represents “a uniqueness” (81). Human beings are responsible for the creation entrusted to their care and their freedom is a mystery that can promote development or cause degradation. “Each creature has its own purpose. None is superfluous. The entire material universe speaks of God’s love” (84). With St John Paul II, we can say that “alongside revelation properly so-called, contained in sacred Scripture, there is a divine manifestation in the blaze of the sun and the fall of night” (85). Throughout the universe and in its complementarity, the inexhaustible richness of God is expressed; it is the place of his presence, and it invites us to adoration. “Called into being by one Father, all of us are linked by unseen bonds and together form a kind of universal family, a sublime communion which fills us with a sacred, affectionate and humble respect” (89). This does not mean that we are making the earth divine or denying the primacy of the human being within creation. Likewise, “a sense of deep communion with the rest of nature cannot be real if our hearts lack tenderness, compassion and concern for our fellow human beings” (91). “The earth is essentially a shared inheritance, whose fruits are meant to benefit everyone”, and those who possess a part are called to administer it with respect for a “social mortgage” that applies to all forms of ownership (93). Jesus invited his disciples “to recognize the paternal relationship God has with all his creatures” (96) and to “live in full harmony with creation” (98), without despising the body, the material or pleasant things of life. “The destiny of all creation is bound up with the mystery of Christ” (99) and, at the end of time, all things will be consigned to the Father. “In this way the creatures of this world no longer appear to us under merely natural guise because the risen One is mysteriously holding them to himself and directing them towards fullness as their end” (100). This chapter analyses the current situation “so as to consider not only its symptoms but also its deepest causes” (15), in a dialogue with philosophy and the social sciences. It is right to appreciate and recognize the benefits of technological progress for its contribution to sustainable development. But technology gives “those with the knowledge, and especially the economic resources to use them, an impressive dominance over the whole of humanity and the entire world” (104). Humanity needs “a sound ethics, a culture and spirituality genuinely capable of setting limits and teaching clear-minded self-restraint” (105). The dominant technocratic mentality perceives reality as something that can be manipulated limitlessly. It is a reductionism that involves all aspects of life. Technological products are not neutral, for “they create a framework which ends up conditioning lifestyles and shaping social possibililties” (107). The technocratic paradigm also dominates economy and politics. In particular, “the economy accepts every advance in technology with a view to profit …]. Yet by itself the market cannot guarantee integral human development and social inclusion” (109). Trusting technology alone to resolve every problem means “to mask the true and deepest problems of the global system” (111), given “that scientific and technological progress cannot be equated with the progress of humanity and history” (113). A “cultural revolution” (114) is needed to recover values. Putting technical reasoning above reality, modern anthropocentrism no longer recognizes nature as a valid norm and living refuge (Guardini). We thereby lose the possibility of understanding the place of human beings in the world and our relationship with nature, while “our ‘dominion’ over the universe should be understood more properly in the sense of responsible stewardship” (116). The critique of a misguided anthropocentrism is not a move towards an equally imbalanced “biocentrism”, but towards an“adequate anthropology” (118) that keeps in first place “the importance of interpersonal relations”(119) and the protection of all human life. “Concern for the protection of nature is also incompatible with the justification of abortion” (120). – Practical relativism: A misguided anthropocentrism “which sees everything as irrelevant unless it serves one’s own immediate interests” leads to relativism in practice. There is a logic in all this “whereby different attitudes can feed on one another, leading to environmental degradation and social decay” (122). “When the culture itself is corrupt and objective truth and universally valid principles are no longer upheld, laws can only be seen as arbitrary impositions or obstacles to be avoided” (123). – The need to protect employment: Integral ecology “needs to take account of the value of labour” (124). Everyone must be able to have work, because it is “part of the meaning of life on this earth, a path to growth, human development and personal fulfilment” (128), while “to stop investing in people, in order to gain greater short-term financial gain, is bad business for society” (128). In order that everyone can really benefit from economic freedom, “restraints occasionally have to be imposed on those possessing greater resources and financial power” (129). – New biological technologies: The main reference is to genetically modified organisms (GMOs), “a complex environmental issue” (135). Even though “in some regions their use has brought about economic growth which has helped to resolve problems, there remain a number of significant difficulties” (134), starting from the fact that “the productive land is concentrated in the hands of a few owners” (134). Pope Francis thinks particularly of small producers and rural workers, of biodiversity, and the network of ecosystems. Therefore “a broad, responsible scientific and social debate needs to take place, one capable of considering all the available information and of calling things by their name”, starting from “various lines of independent, interdisciplinary research” (135). The heart of the Encyclical’s proposals is integral ecology as a new paradigm of justice. It “will help to provide an approach to ecology which respects our unique place as human beings in this world and our relationship to our surroundings” (15). In fact, “nature cannot be regarded as something separate from ourselves or as a mere setting in which we live” (139). This holds true in all fields: in economy and politics, in different cultures and particularly in those most threatened, and even in every moment of our daily lives. There is a relationship between environmental issues, and social and human issues, that can never be broken. “Today, the analysis of environmental problems cannot be separated from the analysis of human, family, work-related and urban contexts, and of how individuals relate to themselves” (141). Consequently, it is “essential to seek comprehensive solutions which consider the interactions within natural systems themselves and with social systems. We are not faced with two separate crises, one environmental and the other social, but rather one complex crisis which is both social and environmental” (139). Everything is connected. Time and space, physical, chemical and biological components of the planet, form a network that we will never fully understand. Fragmented and isolated knowledge must be integrated into a broader vision that considers “an interrelation between ecosystems and between the various spheres of social interaction” (141), and also involves the institutional level, because “the health of a society’s institutions affects the environment and the quality of human life” (142). “Ecology, then, also involves protecting the cultural treasures of humanity” (143) in the broadest sense. It is necessary to integrate the rights of peoples and cultures with the proactive involvement of local social actors from their own culture, with “particular concern for indigenous communities” (146). Integral ecology involves everyday life. The Encyclical gives particular attention to the urban environment. The human being has a great capacity for adaptation, and “an admirable creativity and generosity is shown by persons and groups who respond to environmental limitations by alleviating the adverse effects of their surroundings and learning to live productively amid disorder and uncertainty” (148). Nevertheless, authentic development presupposes an integral improvement in the quality of human life: public space, housing, transportation, etc. (150-154). The human dimension of ecology also implies “the relationship between human life and the moral law, which is inscribed in our nature” (155). “Our body itself establishes us in a direct relationship with the environment and with other living beings. The acceptance of our bodies as God’s gift is vital for welcoming and accepting the entire world as a gift from the Father and our common home, whereas thinking that we enjoy absolute power over our own bodies turns, often subtly, into thinking that we enjoy absolute power over creation” (155). Integral or human ecology “is inseparable from the notion of the common good” 158). In the contemporary world, where “injustices abound and growing numbers of people are deprived of basic human rights and considered expendable”, working for the common good means to make choices in solidarity based on “a preferential option for the poorest” (158). The common good also regards future generations: “We can no longer speak of sustainable development apart from intergenerational solidarity” (159), without, however, forgetting the poor of today “whose life on this earth is brief and who cannot keep on waiting” (162). This chapter addresses the question of what we can and must do. Analyses are not enough. We need proposals “for dialogue and action which would involve each of us individually no less than international policy” (15). They will “help us to escape the spiral of self-destruction which currently engulfs us” (163). For Pope Francis it is imperative that practical proposals not be developed in an ideological, superficial or reductionist way. For this, dialogue is essential, a term present in the title of every section of this chapter. “There are certain environmental issues where it is not easy to achieve a broad consensus… The Church does not presume to settle scientific questions or to replace politics. But I am concerned to encourage an honest and open debate, so that particular interests or ideologies will not prejudice the common good” (188). “Interdependence obliges us to think of one world with a common plan”, proposing solutions “from a global perspective, and not simply to defend the interests of a few countries” (164). The Encyclical is not afraid to judge international dynamics severely: “Recent World Summits on the environment have failed to live up to expectations because, due to lack of political will, they were unable to reach truly meaningful and effective global agreements on the environment” (166). Instead, as Popes have repeated several times starting with Pacem in terris, what is needed are forms and instruments for global governance (175): “an agreement on systems of governance for the whole range of the so-called -global commons’” (174). “Local individuals and groups … are able to instill a greater sense of responsibility, a strong sense of community, a readiness to protect others, a spirit of creativity” (179) and a deep love for one’s own land. Politics and economy need to abandon the logic of short-sighted efficiency, focused on profit alone and short-term electoral success. It is essential to analyze and evaluate business proposals from an environmental and social point of view so as not to harm the most disadvantaged populations (182-188). It is necessary to foster the development of honest and transparent decision making processes, in order to “discern” which policies and business initiatives can lead to “genuine integral development” (185). In particular, the environmental impact study of a new project “demands transparent political processes involving a free exchange of views. On the other hand, the forms of corruption which conceal the actual environmental impact of a given project in exchange for favours usually produce specious agreements which fail to inform adequately and to allow for full debate” (182). Starting from the global crisis, “a new economy, more attentive to ethical principles, and new ways of regulating speculative financial practices and virtual wealth” (189), should be developed. “The environment is one of those goods that cannot be adequately safeguarded or promoted by market forces” (190). Looking at things differently allows us to realize that “a decrease in the pace of production and consumption can at times give rise to another form of progress and development. Efforts to promote a sustainable use of natural resources are not a waste of money, but rather an investment capable of providing other economic benefits in the medium term” (191). More radically, “redefining our notion of progress” (194) is necessary, linking it to improvements in the real quality of people’s lives. At the same time, “economics without politics cannot be justified” (196). Together they are called to take on a new integral approach. The empirical sciences do not completely explain life, and technical solutions are ineffective “if we lose sight of the great motivations which make it possible for us to live in harmony, to make sacrifices and to treat others well” (200). These are often expressed in the language of religions. Nevertheless, believers must live in a way consonant with their own faith and not contradict it by their actions. Religions must enter into “dialogue among themselves for the sake of protecting nature, defending the poor, and building networks of respect and fraternity” (201). At the same time, dialogue among the sciences helps to overcome disciplinary isolation. “An open and respectful dialogue is also needed between the various ecological movements” (201). Dialogue requires patience, self-discipline and generosity. The final chapter goes to the heart of ecological conversion, to which the Encyclical invites everyone. The roots of the cultural crisis are deep, and it is not easy to reshape habits and behaviour. Education and training are key. “Change is impossible without motivation and a process of education” (15). All educational sectors are involved, primarily “in school, in families, in the media, in catechesis” (213). Despite practical relativism and the consumer culture, “all is not lost.Human beings, while capable of the worst, are also capable of rising above themselves, choosing again what is good, and making a new start, despite their mental and social conditioning… No system can completely suppress our openness to what is good, true and beautiful, or our God-given ability to respond to his grace at work deep in our hearts. I appeal to everyone throughout the world not to forget this dignity which is ours” (205). Changes in lifestyle and consumer choices can bring much “pressure to bear on those who wield political, economic and social power” (206). “If we can overcome individualism, we will truly be able to develop an alternative lifestyle and bring about significant changes in society” (208). The importance of environmental education cannot be overstated. It is able to affect daily actions and habits, the reduction of water consumption, the sorting of waste and even “turning off unnecessary lights” or wearing warmer clothes so as to use less heating (211). Faith and Christian spirituality offer profound motivations toward “a more passionate concern for the protection of our world” (216), following the example of St Francis of Assisi. Personal change is essential but not enough. “Social problems must be addressed by community networks” (219). Ecological conversion implies gratitude and generosity and develops creativity and enthusiasm (220). As proposed in Evangelii Gaudium, “sobriety, when lived freely and consciously, is liberating” (223). Similarly, “happiness means knowing how to limit some needs which only diminish us, and being open to the many different possibilities which life can offer” (223). “One expression of this attitude is when we stop and give thanks to God before and after meals” (227). “An integral ecology is also made up of simple daily gestures which break with the logic of violence, exploitation and selfishness” (230). With its civic and political dimensions, “love for society and commitment to the common good are outstanding expressions” of charity (231). In society there are countless associations that intervene in favour of the common good by preserving the natural and urban environments. We encounter God not only in intimacy, but also in the contemplation of creation which bears a sign of his mystery. The Sacraments show, in a privileged way, how nature was assumed by God. Christianity does not reject matter and the body, but fully values them. In particular, the Eucharist “joins heaven and earth; it embraces and penetrates all creation… Thus, the Eucharist is also a source of light and motivation for our concerns for the environment, directing us to be stewards of all creation” (236). “For Christians, believing in one God who is trinitarian communion, suggests that the Trinity has left its mark on all creation” (239). The human person is also called to assume the trinitarian dynamism, going out of oneself “to live in communion with God, with others and with all creatures” (240). Mary, who cares for Jesus, now lives with him and is Mother and Queen of all creation. “All creatures sing of her fairness” (241). At her side, Joseph appears in the Gospel as a just man and worker, full of the tenderness of one who is truly strong. Both can teach and motivate us to protect this world that God has given us. In the end we find ourselves before the infinite beauty of God: “Eternal life will be a shared experience of awe, in which each creature, resplendently transfigured, will take its rightful place and have something to give those poor men and women who will have been liberated once and for all” (243). Our struggles and concerns do not take away the joy of hope, because “in the heart of this world, the Lord of life, who loves us so much, is always present” (245) and his love always compels us to search for new ways. Praise be to him. “At the conclusion of this lengthy reflection which has been both joyful and troubling” (246), the Holy Father proposes that “we offer two prayers”: A prayer for our earth and A Christian prayer in union with creation (246). 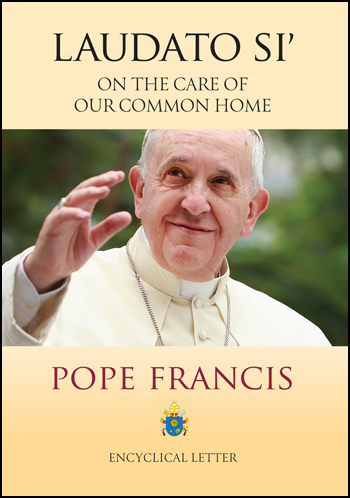 This entry was posted in Catholic Social Teaching, human ecology, Laudato Si, Uncategorized. Bookmark the permalink.